How do we tackle congestion? Our Smart Cities programme is now nearly four years old. A number of cities have already implemented ITS systems or are in the process of doing so at the cost of taxpayers’ money. It is in public interest to make sure that these systems are put to effective use and achieve the desired benefits, the key outcome being reduced congestion and associated benefits such as reduced pollution. We now need to look at how we could achieve these results using the technology that is currently deployed. 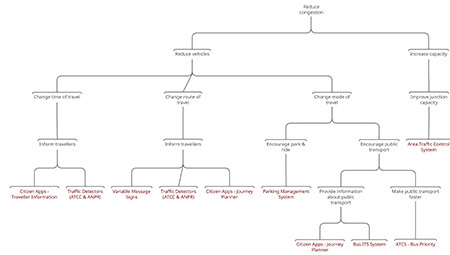 Systems in the mobility domain that are typically installed in Smart Cities are the following: Area Traffic Control System (ATCS), Red-Light Violation Detection System (RLVD), Speed-Limit Violation Detection System (SVDS), Automatic Traffic Counters and Classifiers (ATCC), Automatic Number Plate Recognition (ANPR) cameras, Smart Parking Systems, Bus ITS System consisting of on-bus ITS devices and live bus information at bus stops and bus stands, Variable Message Signs (VMS) and citizen apps. Each of the system achieves efficiency within its scope. For example, the ATCS system optimises signal timings such that the total vehicle delay is minimised and the traffic flow at junctions is maximised. 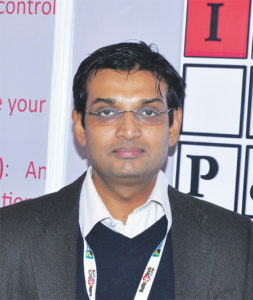 However, there is limited interaction between different systems in the Smart City ecosystem. Most demand management measures require dynamic logic that works across multiple Smart City systems. It is imperative that we provide a platform for such functionality to be implemented as the Smart City ecosystems evolve over time in order to realise maximum returns from the investment. The Smart City ecosystem consists of an Integrated Command and Control (ICC) software that integrates the individual systems in a Smart City. Some Smart Cities are also implementing Integrated Traffic Management System platforms that integrates systems in the mobility domain in addition to the ICC. At the current level of maturity, the ICC and ITMS merely integrate key data from various Smart City systems to provide live dashboards. There is little cross-system integration logic implemented to achieve operational efficiency. There is a clear potential to achieve higher levels of efficiency in doing so. Let us take step back and a look at how we could reduce congestion and then see how we can implement these concepts using system level functionality at the ICC or ITMS level. 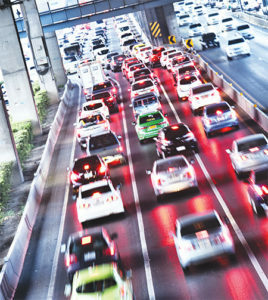 Traffic congestion is due to traffic demand exceeding the supply. Simply put, there are too many vehicles on the road compared to the capacity during peak hours. Traffic delay increases exponentially as demand approaches capacity, as we know from queuing theory, resulting in severe delays during peak hours. To reduce congestion, we need to either increase road capacity or reduce the number of vehicles during peak hours. It is well established that the former strategy will not lead to long-term solutions due to the generation of induced travel demand. The Smart City systems aims to reduce congestion through the second strategy, for the most part. A high level view of how this could be achieved is shown in the figure. ATCS is the only Smart City system that aims to improve capacity. Traffic signals are basically a timesharing scheme for the shared space at junctions and ATCS dynamically manages the utilisation of the shared space based on real-time traffic, thus improving the capacity. However, ATCS has to be operated in conjunction with robust demand management procedures in order to reduce congestion. Key aspects of demand management aim to reduce the number of vehicles in critical road sections when they are oversaturated. This can be achieved by persuading the travelling public to change their time of travel, change their travel route and shift to public transport from private vehicles. Smart City ITS system can play an effective role in all of the above. Simply by providing information about live traffic conditions and average traffic conditions at different times of the day, travellers can see the benefit of changed departure times. Those with flexibility in daily schedules will alter their departure times for faster journeys. Citizen mobile apps, and even Smart City and third party websites, are appropriate channels to communicate this information and educate the public. The underlying information to enable this is generated by the ATCS system and traffic detectors such as ANPR and ATCC. Cities like London have implemented this strategy with quantifiable results. Cities can also persuade travellers to take an alternate route if a given route is congested if sufficient information about trip origin and destination are known. VMS boards are an ideal medium to convey such route choice advice along with mobile applications with journey planning functionality. Again, the underlying information to provide dynamic route guidance advice is generated by systems such as ATCS, ATCC and ANPR. This requires integration between ATCS, ATCC, ANPR, VMS and mobile apps. Mode shift from private to public vehicles is another way to reduce the number of vehicles on the road. In order to achieve this, the efficiency of public transport system needs to improve and the citizens need to be given information about the system in an easily accessible manner. The bus-priority (sometimes coupled with compensation) function implemented in Smart Cities aims to achieve the former ensuring faster progression for buses (typically the late running ones) at signals. The journey planning function in Citizen Mobile Apps enables the citizens to plan their journeys using public transport by removing the information barrier. This is especially relevant in larger cities with large migrant populations who may be unfamiliar with the public transport system. Similarly, live bus information through mobile apps and display units at bus stops reduces information anxiety and reduces the barrier for public transport adoption. This needs integration between the bus ITS system, ATCS and mobile apps. Provision of bus priority for late running buses needs a function in the ITMS platform to dynamically turn the bus priority on and off depending on live data from the bus ITS system. Lastly, the travellers can be actively encouraged to shift from cars to public transport mid-journey so that travellers use public transport at congested sections of the road network. The concept is called Park and Ride (P+R). Smart implementation of a P+R scheme will involve actively encouraging drivers to shift to public transport mid-journey by utilising one of the smart car parks and using public transport for the reminder of their trip when the roads are congested. VMS and mobile apps can be used to reach out to commuters for this. Of course, this can be done only if there is availability at appropriate parking lots. It is also possible to implement dynamic pricing for parking based on the level of road congestion to induce mode shift. This needs dynamic integration between the Smart Parking system, ATCS, ATCC, ANPR, VMS and mobile apps at the ITMS level. To summarise, we need a structured approach to reduce the number of vehicles on the road during peak hours and reduce congestion. This can be achieved by improving junction capacity using ATCS and reducing the number of vehicles on the road using a number of demand management measures.